Crossbow Parts Alchem serves as a reseller of finished prods and strings, and a machining service providing rough unfinished parts to crossbow manufacturers. We do not provide complete kits. However, in April of 2016 we began manufacturing and selling complete finished crossbows. 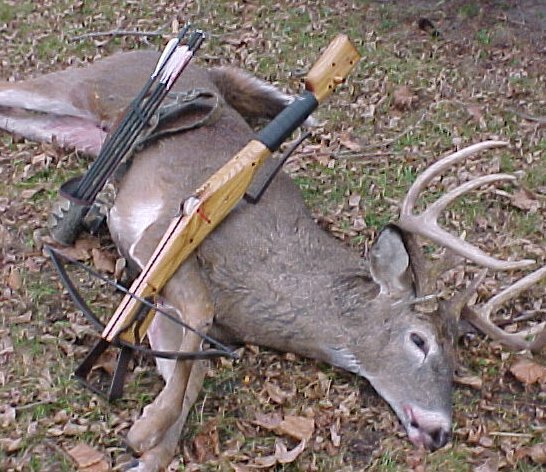 Links to recommended manufacturers of other types of crossbows and kits may be found at the bottom of this page. The following is a list of materials and parts we currently supply. Many items are in stock and ready for immediate delivery. Others are produced in response to orders. Additionally we can supply some custom parts in large or small quantities. For a quote, submit a drawing and specifications. Please allow up to 6 weeks for delivery of custom orders. Our crossbow prods now come with a six inch length of heat shrink tubing serving as a safety strap "sichern". These extend form the center of the prod outward, three inches on both sides. 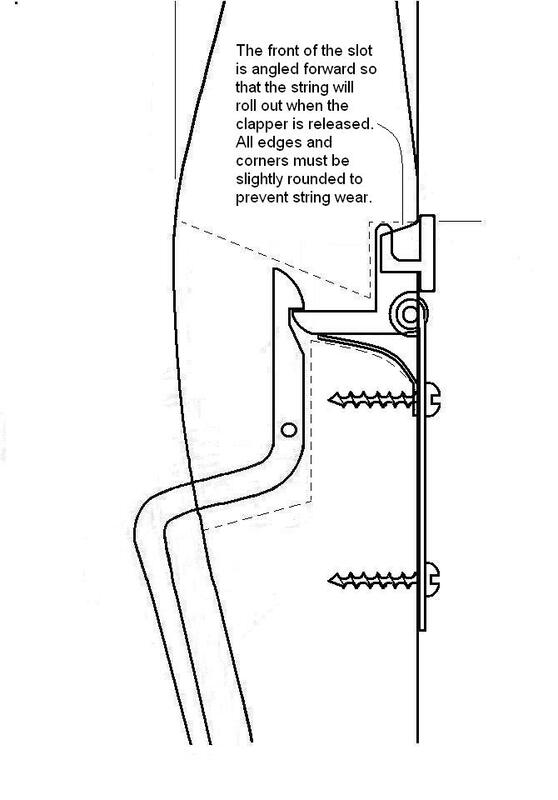 Safety straps are intended to reduce the chance of the shooter or a bystander being injured by a broken limb. Breakage, if it occurs, is nearly always confined to the area of maximum stress, from the center of the prod, to an inch or so beyond the point where the prod presses against the stock. This tubing should not be removed, since to do so creates a danger of injury to the user. If necessary, the safety strap may be covered with leather or some similar flexible material. The below listed items are made of high carbon spring steel which has been precisely hardened and tempered for optimal strength and durability. These are available in mill black or plain steel finish. Prods are shipped black and treated to resist rust unless otherwise requested. All models are available in a range of draw weights. When ordering, please specify the approximate weight desired and we shall match your request as closely as possible. 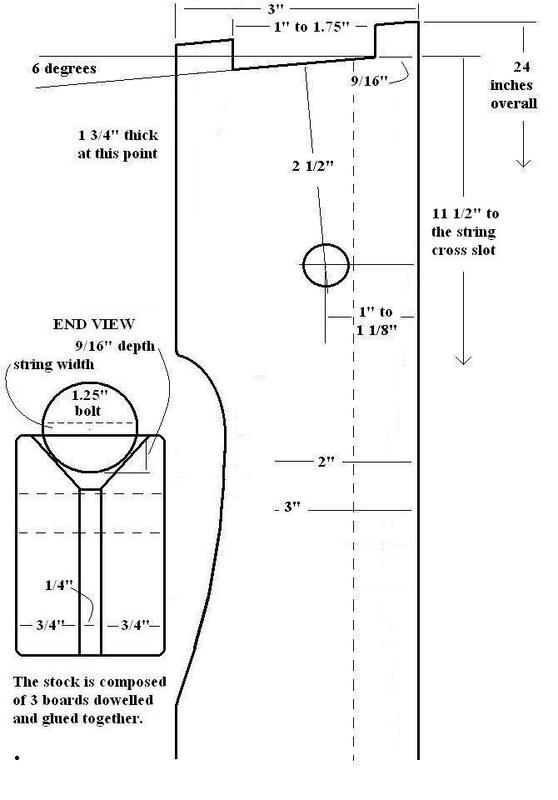 Most of our models are designed for a recommended draw of 8 inches from a 3 1/2 inch brace. 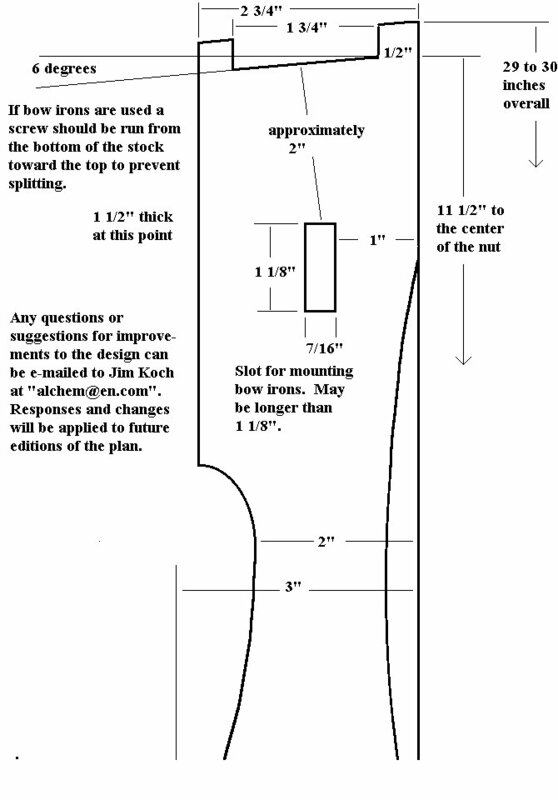 In other words, allow 11 1/2 inches from the mounted prod to the fingers of the release. These prods with model numbers beginning in 1, 2, or 3 use a 27 inch Dacron B50 string. The exceptions are models beginning with the numbers 6 or 7. Model 6 prods are designed for a recommended draw of 9 3/4 inches from a 5 inch brace. This equals a total distance of 14 3/4 inches from the center of the belly of the prod to the fingers of the release. Model 6 prods work fine as a replacement for the original aluminum prods on old Powermaster crossbows and require a 31 inch Dacron B50 string. 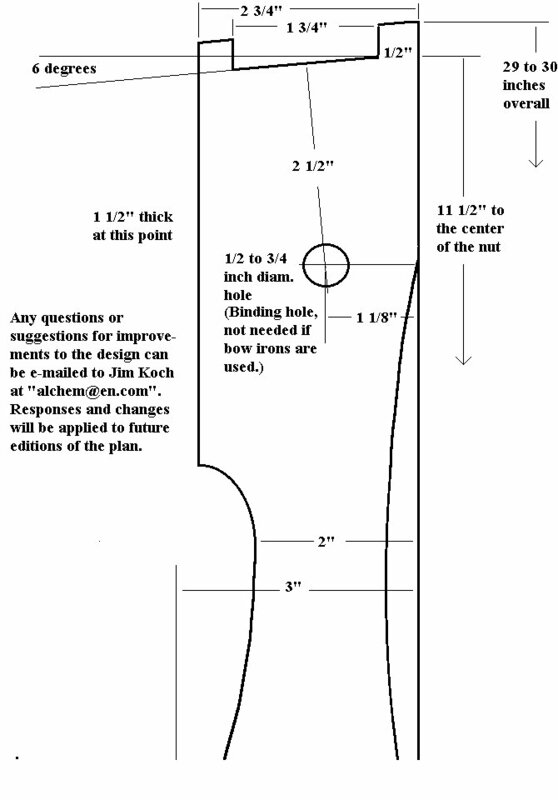 Model 7 prods are designed for a recommended draw of 9 1/2 inches from a 4 inch brace. This equals a total distance of 13 1/2 inches from the center of the belly of the prod to the fingers of the release. 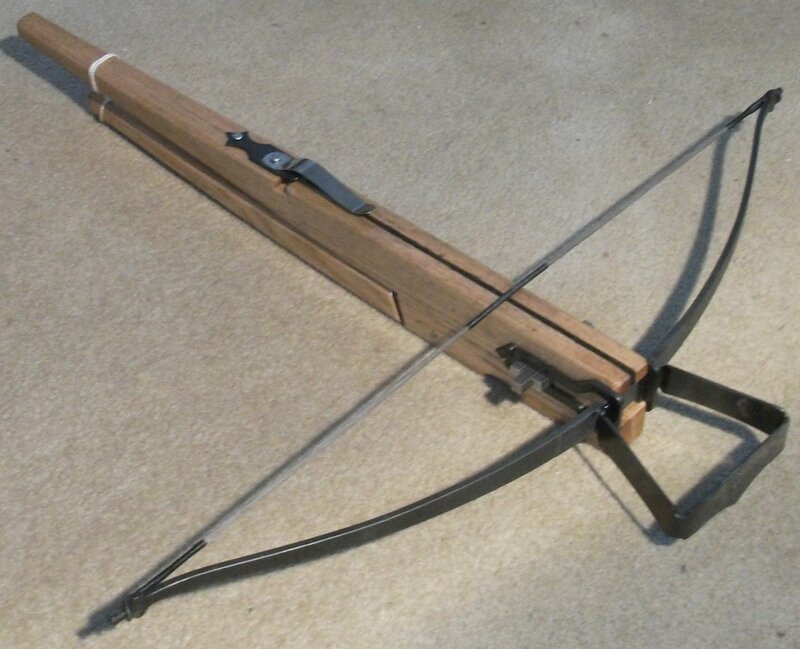 Model 7 prods work fine as replacements for many Barnett crossbows such as the Commando or Wildcat and the many Asian copies of the Wildcat. Model 7 prods require a 30 1/4 inch string. Regardless of model a greater draw length than recommended should be avoided since this may lead to premature breakage of the part. For more detailed draw weight calculations and charts, go to our draw weight data page. The following PayPal shopping cart buttons include estimated shipping charges. If you order several crossbow prods and overpay, the excess shipping charges will be refunded. Dacron B50 strings are now available to fit all of our prods. Remember to specify the model of prod when ordering. Strings sell for $14.00 if ordered and shipped with a prod or $15.00 if ordered alone. This price includes postage to customers in the US. Strings are available to foreign customers at a price of $14.00, but only when shipped along with another item. 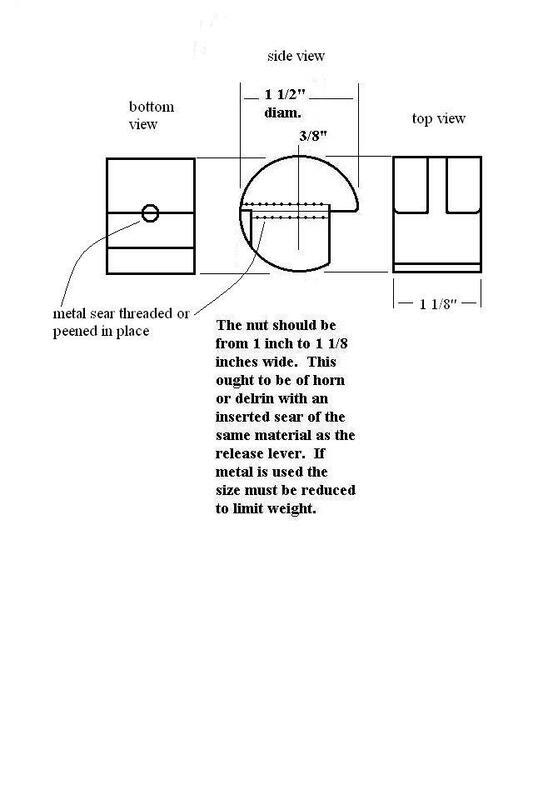 Rough cut steel release lever blanks identical to the one depicted on our plan below are available for $16.00 if ordered with a prod, or $18.00 if ordered alone. This price includes postage to customers in the US (Foreign customers pay $15.00 and add Global Parcel Post charges. Shipping weight 0.25 lbs (.11 kg). 1 1/2" (38mm) diameter natural (off white) ABS plastic rod, cut and faced to a length of 1" (25mm) is available for making release roller nuts. These sell for $4.00 if ordered and shipped with a prod, lever or bow irons, or $4.50 if ordered alone. This price includes postage to customers in the US. 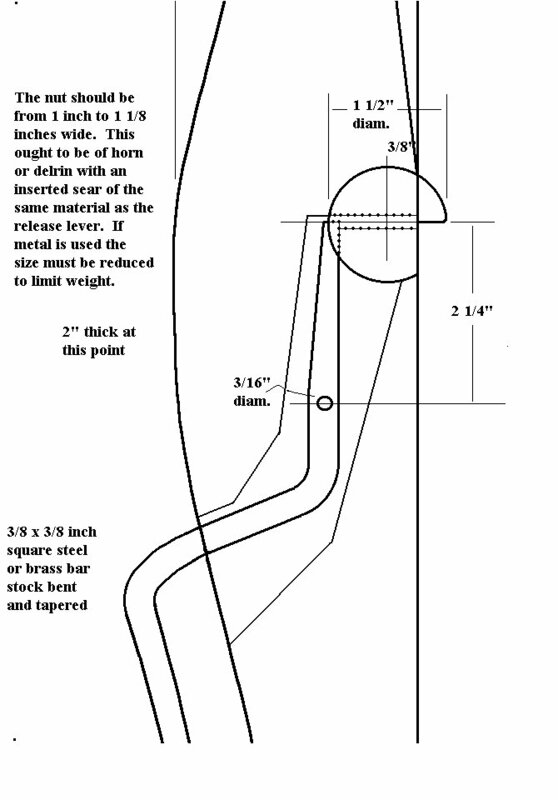 Lengths are available to foreign customers at a price of $4.00, but only when shipped along with a prod, lever or bow irons. 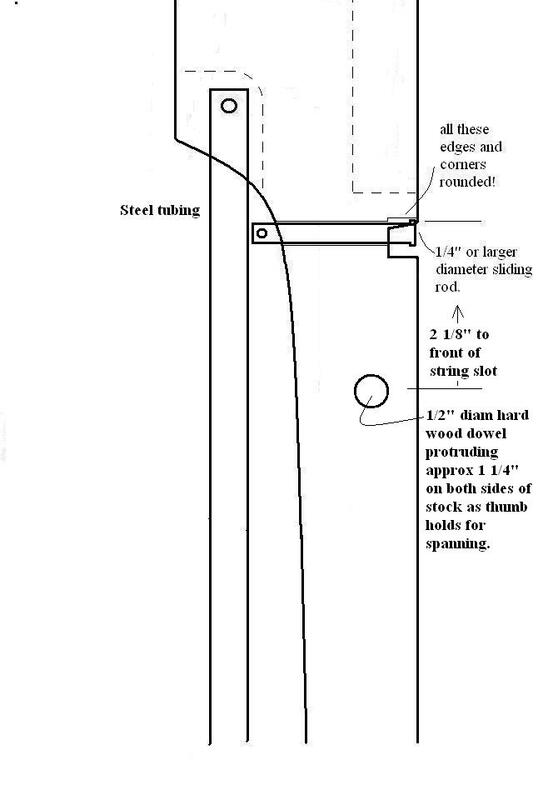 Unfinished steel claplock release mechanisms, similar to the one depicted on our plan below, are available for $16.00 if ordered with a prod, or $18.00 if ordered alone. These consist of a clapper, hinge plate, and hinge pin. 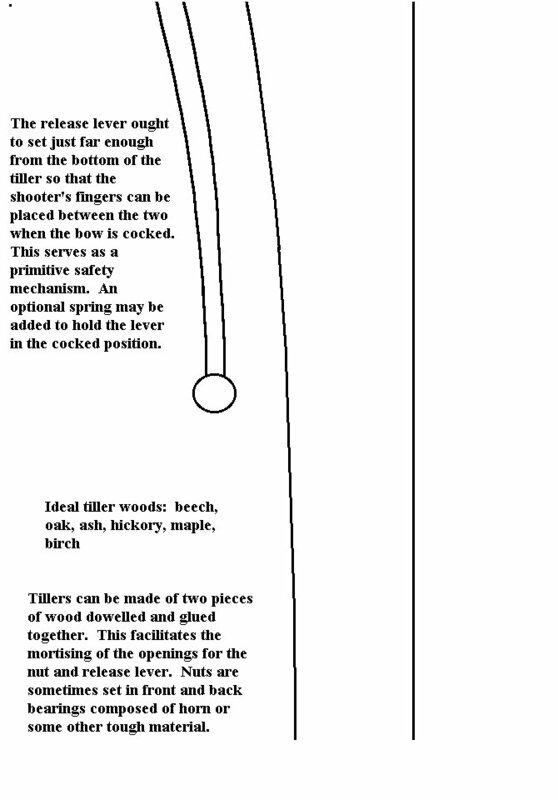 The purchaser must cut the sear to the required length and fabricate any necessary springs. This price includes postage to customers in the US (Foreign customers pay $15.00 and add Global Parcel Post charges. Shipping weight 0.25 lbs (.11 kg). 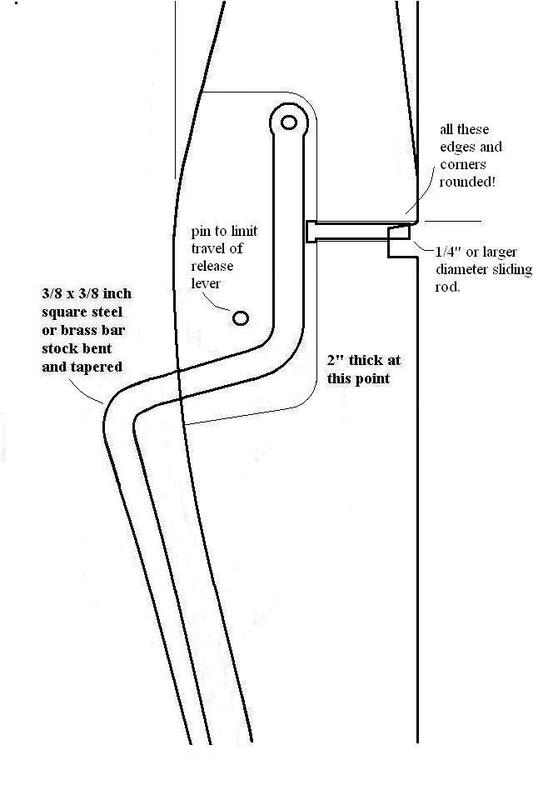 Rough cut steel claplock release lever blanks (trigger bars), similar to the one depicted on our plan below, are available for $16.00 if ordered to be shipped with a release mechanism, or $18.00 if ordered alone. This price includes postage to customers in the US (Foreign customers pay $15.00 and add Global Parcel Post charges. Shipping weight 0.25 lbs (.11 kg). A photo of our bow irons in use may be seen by clicking here. These are shipped as sets consisting of 2 side plates, 2 blocks, 2 wedges and a stirrup. Sets are rough cut and require customization and finishing. These are designed to fit tillers from 1 1/2 inches to 2 1/4 inches thick. Sets sell for $48 with stirrup or $43 without. Stirrups alone sell for $7. This price includes postage to customers in the US (Foreign customers deduct $1 from the previous prices and add Global Parcel Post charges. Bow irons are available to fit either model 1 or model 2 prods. The wider model 1 irons will accommodate prod models 1, 2, 3, and 6. The narrower model 2 irons will accomodate prod models 2, 3, and 6. Bow irons should not be used with Fast Flite string. Shipping weight 1.20 lbs (.54 kg).